Hopefully everyone guessed “the Italians” at the end of last week's blog post. 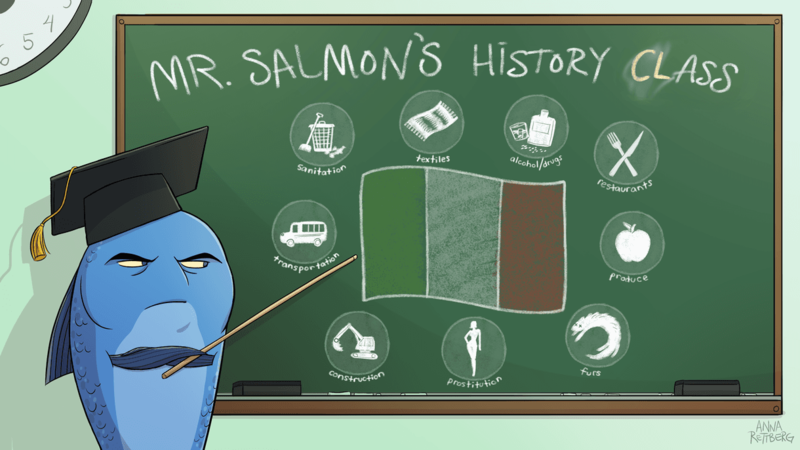 If you didn’t, well… Mr. Salmon already thinks you’re a slacker, so I suppose it’s no big deal. Anyway, consistent Italian immigration to New York City coupled with the Irish moving on to better-paying jobs eventually saw the Italians replace the Irish as the dominant ethnicity working at New York’s port. Sometime around 1915, Italians began to overtake the Irish in terms of numbers, and by the 1930s, they comprised the majority of longshoremen and dominated the organizational politics as well. Which of course meant they also began to dominate its organized crime. Italian organized crime in New York City was nothing new, however. The Italian mafia didn’t magically appear in New York City in the 1920s or 1930s once they’d become a more populous ethnic group. Gangs headed by Italian immigrants had been around for quite some time — for example, there was a notable counterfeiting scheme by The Morello Family busted by the Secret Service in 1910. But it wasn’t until the 20s and 30s that they became dominant. Now, mafia history, if you can call it that, is always plagued by inaccuracy. Considering how difficult it is for historians to agree on regular history, where many things are being reported in the open and recorded diligently, you can imagine how difficult it is to get a consensus picture of such a clandestine thing as organized crime. So really, a lot of the details of what happened during the formative years of Italian organized crime are often unclear. But what does seem to be true in the larger picture is that the rise of Italian organized crime coincides with an overall unification of organized crime across many of New York’s ethnic crime syndicates. Before the 1930s, New York City’s mobsters often fought each other. Irish mobsters, Italian mobsters, Jewish mobsters, and black mobsters (the story of organized crime in Harlem, by the way, is pretty amazing, but we’ll get to that later) were all constantly vying for territory and fighting each other. As you might expect, it’s kind of hard to maintain a monopoly on violence if people are constantly aware of other violent actors in the area who clearly have some ability to carry out violence on their own. So the degree to which the Italian mafia could have controlled the city was curtailed by both their infighting and their conflicts with rival organizations. But in the fall of 1931, this began to change. The Italian mafia formed a legislative body of sorts for their criminal enterprise, with the heads of each individual organization getting a seat. The main idea here was to eliminate all infighting, and to regularize relations with rival enterprise as much as possible. Certain key individuals at this time (who we’ll talk about later) also had ties to the other major ethnic organized crime syndicates, and astutely recognized that it was much more profitable to work with them than to fight them. So slowly, over the course of about a decade, all of New York’s organized crime — irrespective of ethnicity — was brought under a single, unified umbrella. Unified leadership of organized crime is not exactly a great thing for a city. With the infighting and vying for territory out of the way, the mafia in the 1930s became a truly widespread enterprise. Going back to the concept of sovereignty, the key thing that had allowed the ports to be so lucrative for Irish organized crime (and the Sicilian mafia, going back to Palermo) was that it was a de facto monopoly on shipping, in the complete sense of the term: not only did the mafia control all the shipping commercially, but they also controlled the enforcement of rules and contracts, and could be as arbitrary as they wanted. In fact, the idea that you inevitably had to pay the mafia some money in order to ship things into or out of New York City was so ingrained that it was often called the “mob tax”, just like you would call the money a regular sovereign (like the city) collected. As the mafia unified organized crime throughout the city, this concept of the “mob tax” was regularized across a dazzling array of industries: restaurants, produce, furs, textiles, construction, transportation, sanitation… you name it, they took a cut. In some cases, this was a direct result of the unification — the Jewish mafia, for example, had been taking a cut of the garment industry in New York for years, so once they were allied with the Italians, that industry came under the larger umbrella. In other cases, the mafia simply applied their previous tactics to new industries as they saw the opportunities arise. First, they would target individual shops to coerce them into coming under the mafia umbrella. And by “under the umbrella”, I mean the bakery was forced to regularly pay a cut of its proceeds to the mafia. Once enough bakeries joined the fold, the mafia would limit competition by forcing bakeries that were too densely situated to close, and they would ensure competition remained minimal by threatening those who might open new bakeries. Eventually everyone in the baking business in the mafia territories would all be paying a cut to the mafia, and somewhat symbiotically these bakeries would likely all prosper since the mafia ensured they would never have any competition for their services. In many respects, the mafia became almost an involuntary franchise management body for a number of city industries. Our game, 1935, takes place during the golden era of mafia unification. With this entry, I’ve come to the end of the main historical arc behind our game, 1935. I hope the broad brush strokes of the past few entries have given you some idea of what “organized crime” was in the time period, and where it came from. What remains now is to fill in the details of the year 1935 specifically, and talk about who the people were and what they were doing that made it such an intriguing year in New York mafia history. This will also require talking about some of the organized crime syndicates we haven’t covered yet.